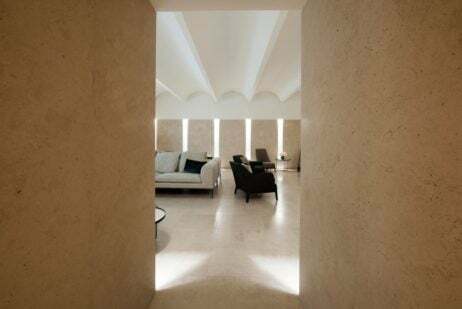 Despite being sprawled across 10,500 sq ft of the fourth floor in Harrods you’d barely know the Knightsbridge department store’s new Wellness Clinic was there as it’s seemingly hidden amid the store’s labyrinth of showrooms and displays. 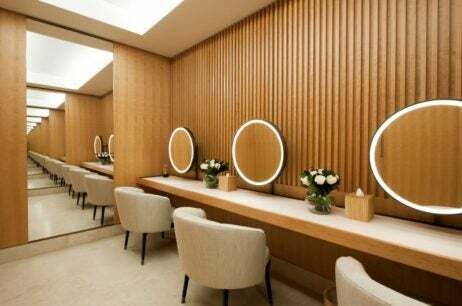 But on entering the spa, the magnitude of this brand new wellness space is immediately clear; said to be the world’s first clinic to offer an integrated approach to wellness and beauty, The Wellness Clinic brings together world-renowned expertise in aesthetics, wellness and dermatology. Aside from the sheer size of this space, what strikes visitors first is the clinic’s contemporary yet warm design. By partnering with award-winning architects Stanton Williams, Harrods has created interiors that place the focus on beauty and tranquility in equal part, incorporating natural cherry timber and moleanos stone with contemporary furnishings and soft fabrics. The interiors flow seamlessly from the luxurious waiting room to each of the ambiently lit treatment rooms and personal training studios, which are cleverly positioned around circular pods for a more intimate feel; the clinic even has hidden corridors enabling staff to pass between treatment rooms discreetly. Each treatment room then features the most state-of-the-art equipment in the spa world—including a cryotherapy chamber—facilitating a range of cutting-edge treatments. This is where visitors can benefit from the expertise of PHI Clinic of 102 Harley Street, Louise Parker who is known for her six-week program The Method, chiropractor and posture specialist Dr Ben Carroway, along with acupuncturist Ross Barr, and global leader in vitamin infusions The Elixir Clinic. Another addition to the portfolio in coming months will be Gen Identity DNA testing and targeted skincare. Together these specialists span the gamut of self-improvement, from nutrition and fitness to aesthetic treatments and skincare. Guest practitioners are set to make an appearance too, including the New York Dermatology Group. 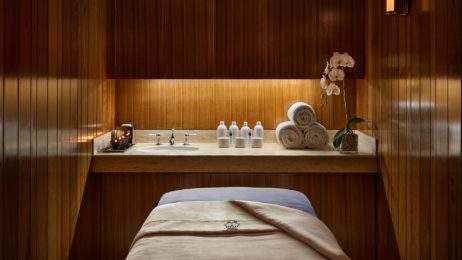 And these guest appearances will be an ongoing series as Harrods seeks out leaders in the spa industry to introduce their signature treatments to The Wellness Clinic or develop exclusive treatments for the occasion, further enhancing the experience guests have in this remarkably serene space.